The machete was found in Cittadino’s vehicle Tuesday. The one pictured on the right was identified by the victim. 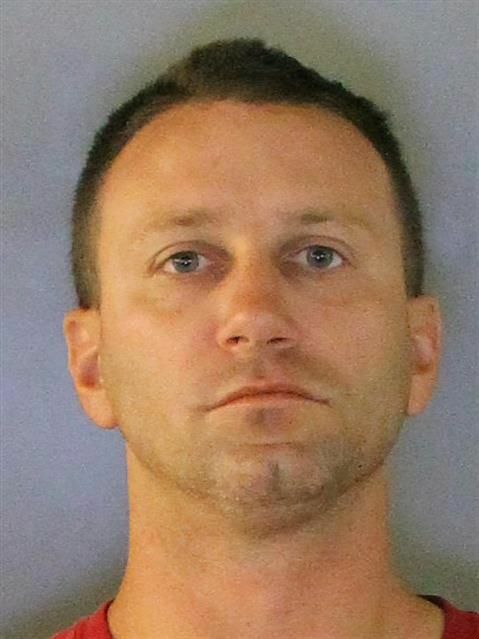 A Punta Gorda man was arrested in a road rage incident Monday after allegedly swinging a machete at the windshield of another driver, the Charlotte County Sheriff’s Office reported. The victim told detectives Michael Cittadino, 38, of the 4400 block of Parnely St., pulled up beside him on the El Jobean Bridge and partially blocked the lane after the victim merged in front of him to avoid the repair barriers of the recently damaged bridge. Traffic was moving slowly, and Cittadino allegedly approached his vehicle with a machete, described as 14 to 16 inches long, swinging it and striking hard enough to cause gouges in the glass, shouting and cursing the entire time. The victim estimated the damage at $500. The victim exited the vehicle to draw Cittadino away from the car, since his girlfriend and child were inside, according to the affidavit. Two of the victim’s co-workers were also in traffic and exited their vehicle to assist the victim. Cittadino then reportedly threw his machete back in his vehicle. The four men were engaged in a verbal altercation that seemed like it was about to get physical when two detectives in an unmarked vehicle spotted them arguing. Cittadino appeared to be moving in an aggressive manner and clenching his fists, according to the affidavit. Detectives gave him several commands to stop moving and display his hands, which he allegedly ignored, reaching in his pockets several times. The detectives grabbed his wrist, while he attempted to pull away. Authorities got statements from people involved, including Cittadino, who was transported to a local hospital for reported back pain and then to the Charlotte County Jail once he was medically cleared. He was charged with aggravated assault with a deadly weapon, criminal mischief between $200 and $1,000 damage, and resisting an officer without violence. On Tuesday, his bond was set at $15,000. Cittadino’s vehicle was towed to the Charlotte County Sheriff’s Office impound yard to await a pending search warrant. On Tuesday, the machete was found in Cittadino’s truck.